Objective: To assess the current periodontal status of 35 to 44-year-olds from the Chinese population and to analyse potential influence factors on periodontal disease. Methods: The data of subjects were collected from both urban and rural areas of all 31 provinces, autonomous regions and municipalities of the mainland of China, as part of the 4th National Oral Health Survey. All subjects were aged 35 to 44 years old. In total, 4,410 subjects were enrolled in the present study. Each subject was asked to undergo a professional oral examination and to fill in a questionnaire. Periodontal health status was evaluated by probe bleeding, calculus, periodontal pocket depth and clinical attachment loss. The data were analysed using the chi-square test and binary logistic regression analysis. Results: The prevalence of probe bleeding and calculus was 87.4% and 96.7% respectively among the 35 to 44-year-old population. Prevalence of shallow pockets (4 mm ≤ PD < 6 mm) and deep pockets (PD ≥ 6 mm) was 45.8% and 6.9% respectively among 35 to 44-year-old people. In addition, prevalence of clinical attachment loss (CAL > 3 mm) was 33.2%. Gender, educational level, smoking, teeth brushing frequency, dental floss and toothpick use were found relevant to periodontal condition. Conclusion: Periodontal disease was highly prevalent among 35 to 44-year-old Chinese adults. Gender, educational level, smoking, teeth brushing frequency, toothpick and dental floss use could be potential influence factors of periodontal health status. Objective: To investigate the status of tooth loss and denture restoration in Chinese adults, analyse the changing trend and provide fundamental data for oral health policy. Methods: According to the protocol of the 4th National Oral Health Survey, a multistage stratified random cluster-sampling method was used to enrol adult subjects aged 35 to 44, 55 to 64 and 65 to 74 years in all 31 provinces, municipalities and autonomous regions of the mainland of China. The status of tooth loss and denture restoration was investigated. SPSS20.0 software was used for statistics analysis. Results: Among the 13,464 subjects investigated, 13.8% had complete dentition, 84.4% had dentition defects, and 1.8% was edentulous. Urban subjects showed a significantly higher proportion of complete dentition than those in rural (P = 0.02), and males showed the statistically higher proportion of complete dentition than females (P = 0.01). The mean of remaining teeth was 26.1 ± 6.90, which in urban areas was significantly higher than in rural areas (P < 0.01). The means of remaining teeth were 29.6 ± 2.3, 26.3 ± 6.1, and 22.5 ± 8.7 in the 35 to 44, 55 to 64 and 65 to 74 age groups, respectively. The detection rate of fixed partial dentures (FPD) was statistically higher in urban than in rural areas and in males than that in females (P < 0.01). The detection rate of removable partial dentures (RPD) was statistically higher in urban areas than in rural locations (P < 0.01). However, the detection rates of irregular denture and unrepair of tooth loss were both significantly lower in urban than in rural areas (P < 0.01). The rate of restoration of tooth loss was 41.6% in Chinese adults. Conclusion: Although the tooth loss and denture restoration status recorded in the survey was improved compared with the results of 10 years ago, more efforts need to be made on strengthening oral health promotion, particularly for elderly people and those living in rural areas. Objective: To explore the clinical and socio-demographic factors inﬂuencing oral health-related quality of life (OHRQoL) of Chinese adults in the 4th National Oral Health Survey. Methods: Multistage stratified cluster sampling and PPS method were used in sampling and 4720 adults aged 35 to 44 years were recruited. The study subjects completed a structured questionnaire in an interview and underwent a clinical examination. The questionnaire was a Putonghua version of the General Oral Health Assessment Index (GOHAI) and was completed by the interviewer on the site of the 4th National Oral Health Survey. Clinical examination was performed using the criteria recommended by the World Health Organization (WHO). Results: The mean GOHAI score of the subjects was 54.42 (SD 6.01). Result of Poisson regression showed that subjects with a higher household income per capita, had lower DMFT, fewer missing teeth, had no unrepaired missing teeth, or not wearing a partial denture had higher GOHAI scores indicating better OHRQoL. Conclusion: The OHRQoL of the adults in China was fair and was mainly inﬂuenced by dental caries, integrity of dentition and restoration of lost teeth. With limited resources and dental manpower in China, higher priority should be given to the prevention and treatment of the main cause leading to losing teeth. Objective: To understand the oral health knowledge, attitude, behaviour and oral health status of Chinese diabetic patients so as to facilitate the development of oral health education programmes for diabetic patients in China. Method: A face-to-face questionnaire was conducted for 1,024 diabetic patients and 8,030 non-diabetic people aged 55 to 74 years old in order to understand their oral health knowledge, attitudes, and behaviour. Oral health examination was implemented including caries, gingival bleeding, dental calculus, periodontal attachment loss, etc. according to the Oral Health Surveys Basic Methods 5th Edition. Results: Compared with non-diabetic patients, those with diabetes had more oral health knowledge and more positive attitudes. The proportion of people who formed toothbrushing habits was higher in diabetic patients, but that of regular scaling and flossing is as low as that in non-diabetic people. The detection rate of deep periodontal pockets in diabetic patients was higher than that in non-patients, while the caries situation was better than that in non-patients. Conclusion: This study has shown that the oral health knowledge, attitude, behaviour and oral health status of the 55 to 64-year-old diabetic population are not optimistic. There is a great need for a systematic oral health education programme in China. The contradiction between a large number of diabetes patients and limited health resources requires us to give priority to the improvement of oral health behaviours, such as educating patients to develop toothbrushing and flossing habits. Objective: To evaluate the use of oral health services, the economic burden of oral diseases and related influential factors in China. Method: Using the multistage, stratified, equal proportion, random sampling method in the 4th National Oral Health Survey of China conducted in 2015 to 2016, residents aged 3 to 5 years, 12 to 15 years, 35 to 44 years, 55 to 64 years, and 65 to 74 years respectively were recruited, clinically examined and answered a questionnaire. Utilisation of oral health services were assessed in all the age groups and the economic burden of oral diseases in the past 12 months were assessed in the 3 to 5 years and 35 to 74 year-old groups. Chi-squared tests, t tests, correlation analysis and a one-way ANOVA were used to determine the relationships of different factors with utilisation of oral health services and the economic burden of oral diseases. Results: In the subject groups - 3 to 5 years, 12 to 15 years and 35 to 74 years - the prevalence of the utilisation of oral health services in the past 12 months was 14.6% (5,876/40,353), 23.6% (27,936/118,592), and 20.1% (2,708/13,461), respectively. In all three groups, receiving dental treatment was the most common reason for subjects' recent dental visit. The average dental cost in the past 12 months was 403.43 CNY (median = 100) for 3 to 5-year-old children and 850.83 CNY (median = 300) for adults aged 35 to 74 years old. Area, education and annual household income per person were the socio-economic influential factors. Oral health status, oral hygiene and attitudes to and knowledge of oral health affected the utilisation of oral health services and the economic burden of oral diseases. Conclusion: The percentage of dental service utilisation was relatively low, and the economic burden was high. The related factors for both utilisation of oral health services and the economic burden of oral diseases included living in area, educational attainment, household income, perceived oral health status, and oral hygiene. Objective: To investigate the current status and distribution of resources for oral health in China, by means of analysing national data from the National Investigation of Resources for Oral Health. Methods: The National Investigation of Resources for Oral Health in China was performed in 2015, in parallel with the 4th National Oral Health Survey of China (2015 to 2016). A structured questionnaire on resources for oral health was used to collect the data of professional institutions and stomatological/dental workforce in each province. For each province, the local Investigation Group was responsible to summarise the status and distribution of institutions with stomatological/dental departments and stomatological/dental workforce. Descriptive analysis of resources for oral health was performed to learn about the number and percentage of each category both for each province and nationally. The ratio of number of stomatological/dental workforce to population was also calculated and compared with the criteria of the World Health Organisation (WHO). Results: There were totally 75,399 stomatological/dental departments nationally in all professional institutions in the mainland of China, most of which were set in institutions of primary health care services. Institutions of private sectors accounted for a higher proportion (69.8%) which was over two-fold compared to that of public ones (30.2%). General hospitals were the major part of hospitals with stomatological/dental departments compared with stomatological/dental specialised hospitals. Stomatological/dental clinics were the majority of institutions of primary health care services, compared to community health care service centres/stations and township health care services. Amongst all professional institutions of public health with stomatological/dental departments, 35.0% were maternal and child health care services and 11.2% were institutions for prevention and control of oral diseases. The total number of stomatological/dental workforce in the country was 314,347, among whom 171,587 (54.6%) were stomatologists/dentists. The ratio of number of stomatologists/dentists to population was 1:7,768 nationally, which was lower than the WHO standard of 1:5,000. 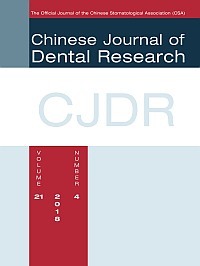 Conclusion: The National Investigation of Resources for Oral Health in China exhibited the current status and distribution of resources for oral health over the country, whereas insufficiencies of stomatological/dental workforce and institutions and inequalities of their distribution were found nationally. This could provide some policy suggestions for the health authorities in China to promote oral health in the Chinese population in the future. Objective: To investigate the oral health status and related factors of 12-year-olds from regions with and without coverage of the National Oral Health Comprehensive Intervention Program in China by means of analysing national data from the 4th National Oral Health Survey. Methods: Data of 12-year-olds participating in the 4th National Oral Health Survey of China were used for statistical analysis. Children who were recruited in the survey completed a dental examination and filled in a questionnaire. Oral health status, pit-and-fissure sealant history, oral hygiene behaviours, sugar consumption habits, status of dental service utilisation, and oral health knowledge were compared between children from regions with and without coverage of the national programme. For the number of decayed, missing and filled permanent teeth (DMFT) and its components, as well as the number of teeth with pit-and-fissure sealants, mean values were statistically tested to see if significance existed between regions covered by the national programme and uncovered regions, whereas caries prevalence and percentage of pit-and-fissure sealants presented were also compared. Results: Data from 27,821 12-year-old children were analysed, among whom 7,726 were from regions covered by the national programme and 20,095 were from uncovered regions. Statistical significance was found in caries experience and activity, pit-and-fissure sealant history, sugar consumption habits, utilisation of dental services and oral health knowledge when compared between the covered and uncovered regions. Prevalence of dental caries and indices for caries experience and activity was lower in regions covered by the national programme than those not covered, while the percentage of pit-and-fissure sealants presented and the number of teeth with pit-and-fissure sealants exhibited higher in the covered regions. This remained the same even if we focused only on the first molars instead of the full dentition. Conclusion: The National Oral Health Comprehensive Intervention Program for Children in China potentially contributed to better oral health status, behaviour and knowledge in 12-year-old children. The expansion and extension of coverage of the national programme was expected to be beneficial for improving oral health status in children, as well as constructing teams of oral and dental workforce and working mechanisms in some underdeveloped regions.